CPT strongly supports Canine Companions for Independence (CCI), the nation’s largest and most respected nonprofit service dog organization. For the past 13 years CPT Trainer Patricia King has operated CCI’s Atlanta puppy raiser classes. In addition, CPT provides its Sandy Springs Training Center at no charge to CCI so that CCI has ample space to hold quarterly meetings and special training events. The partnership with CCI has become even closer since CPT President and Head Trainer Mark Spivak’s canine neuroscience company, Dog Star Technologies, began an extensive research study of CCI dogs. Mark and Dog Star co-founder and Chief Scientist, Prof. Gregory Berns, periodically travel to CCI’s headquarters location to collect data and to meet with CCI’s Director of Research, Kerinne Levy, and CEO, Paul Mundell. On July 18, 2015 CCI’s Atlanta Chapter held its quarterly meeting at CPT. 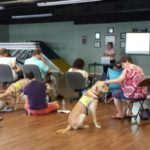 Led by Atlanta Chapter President Dr. Annemiek Kuik, DVM of Treehouse Animal Clinic over 20 CCI volunteers, many with their CCI puppies, service dogs, or release dogs, met at CPT. CCI has an outstanding breeding and training program and CPT appreciates the opportunity to support CCI in its mission to provide quality service dogs free of charge to disabled Americans. Moreover, although CPT also trains service dogs, the CPT-CCI relationship is highly compatible, since CPT helps CCI accomplish its mission to serve those in need. By meeting the service dog objecitves of disabled persons with financial means, CCI can better serve disabled persons who otherwise could not afford a quality service dog. In addition, the exchange of information benefits both organizations to better serve all disabled persons desiring a service animal, regardless of the origin or type of their disability and regardless of their financial situation. CPT looks forward to many more years supporting CCI. If you wish to support CCI, please view the CCI website to learn how to become a puppy raiser or to submit donations! Dr. Annemiek Kuik leads the CCI Atlanta Chapter meeting held at CPT’s Sandy Springs Training Center.